Busy Bee Meets Boss Babes Part 16. Shop Evolve — The Busy Bee Productivity Coaching, LLC. We often go through life looking for a purpose, and ultimately, who we are meant to be. We grow, we face struggles, and we learn, but eventually, we evolve into the most beautiful versions of ourselves, with no apologies. I'm so excited to feature a Boss Babe duo on the blog this week! Emma and Colleen are owners of Shop Evolve in RVA! They are absolutely beautiful and ambitious women with an inspiring story to tell! I connected with Colleen through our mutual friend and boss babe, Remy Thompson! Colleen also owns a photography business! Colleen grew up in Midlothian VA and attended Cosby High School. She says, "I always loved looking through old photographs and seeing how the styles and trends changed over time, as well as the style of photography, specifically because the women in the photos were evidently so strong and confident. I started out taking photography classes in high school, and eventually turned it into a personal business of mine, making it my sole purpose to take and create images that would translate as pieces of art for all of my clients. Now that I am able to combine my photography passion with my passion for style, I feel like I am living my dream every day. In my spare time, you’ll catch me jamming to some old school rap; always ready for whatever life throws at me!" Now it's time to meet Emma! Emma is also from Midlo and is a Cosby HS Grad! She says, "I originally attended the Virginia Military Institute on a soccer scholarship on a pre-med track for the Army, but I soon found out that my heart wasn’t in it, so I decided to chase after something that I had always loved, and that something was fashion." She then went on to VCU’s Fashion Merchandising program where she learned everything from Textiles, to Photoshop, to Line Development, and eventually Entrepreneurship, which is where she found her true love and mission within the fashion industry. She currently lives with her boyfriend and 6 month old golden retriever puppy! Now that you've learned more about them, let's dive into Shop Evolve. Tell us about your background and What led you to pursue your passions and launch your business! Colleen and I both grew up in Midlothian, VA where we first met in 9th grade at Cosby High School. We were always acquaintances and friendly with each other, but we never really took the time to get to know each other well or hang out all that often, so after we both graduated, we went our separate ways until 5 years later when our paths crossed again. I had just graduated from VCU’s Fashion program when Colleen reached out to me about her photography business and asked if I would be interested in shooting with her when she saw that I had taken on an influencer role for brands on my social media platforms, so of course I said yes! Her work was so inspiring and I could tell how talented she was right from the start. I noticed that Colleen saw things behind the camera lens that no one else could see, and we bonded over creating that art together immediately. One day we were shooting, and she asked me what I would think about creating something new and different in the fashion industry that had never been done before, and of course that sparked my interest. We took the rest of the day to bounce ideas off of each other, and before we knew it, we had created evolve. There are many women reading this blog who have a passion or business they want to pursue, but feel held back from their full time job or other responsibilities. I know you both can relate to this because Emma, you work full time at a menswear company (50 hours a week) and Colleen, you run your own photography business. I think hearing about your routines to stay productive would be helpful for our readers. There are so many times we feel completely overwhelmed with everything we have to do! How do you manage to do it all?! One of my biggest pieces of advice for boss babes is to find a tribe, and like-minded women to support them. It's so much better to have someone to talk business with. It can be lonely, especially if you work your business at home. You guys seem so close, and I know how much you value one another. Tell us more about that! How do you support one another? What else keeps you motivated during the tough times? How do you prevent burnout or manage a positive work/life balance? So amazing! 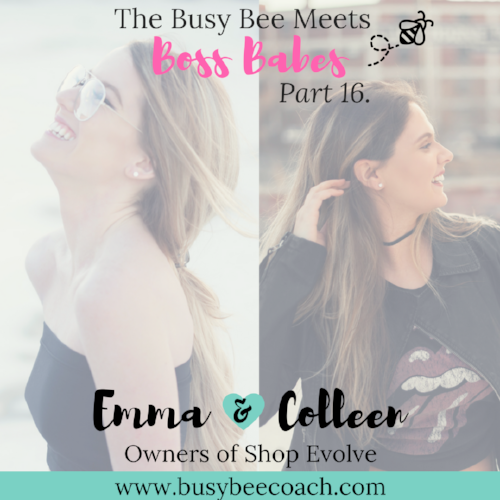 Thank you Colleen and Emma for being part of the Busy Bee Blog! Your story is an inspiration to so many others. I know this is just the beginning for both of you and can't wait to see your new website launch! Shopevolve.co - sign up for the update of the website launch...coming soon! Thanks for being part of the Busy Bee blog, girls! To learn more about my services click here! To schedule a consultation with me and take a step towards your big dream, click here. Newer PostBe More Committed to your DREAMS than your COMFORT ZONE! Older Post5 Ways to be more PRODUCTIVE!